Agreed, this is THE game for the MIT seniors. Winning this one opens the door to running the table for conference title. This team appears to be very focused on that goal (wining the conference, not specifically going unbeaten). Hugenerd, I also agree with you, getting the ball up court and into their offensive sets is critical for MIT. WPI had been playing rather "lazy" going into that Wheaton game. By "lazy" I mean doing just what they needed to get by in beating Coast Guard, Trinity, Clark & Babson. From what I have heard from a couple of Wheaton Alumni, that game on saturday was nasty. The officals lost control of the game early and struggled to get it back all day. They allowed a lot of chippy play and players on both sides got hot. WPI had a 20 point lead late in the 1st half and allowed Wheaton to get back to 10 a couple of times in the second half. These guys were disappointed because Wheaton got up early and looked to have WPI very frustrated. From what they said, the Robinson kid came in from the bench and changed the complexion of the game with some hustle plays and big shots. This was a chance for Wheaton to step up to the top of the conference, but they seems to wilt under the pressure of the moment. According to them, once Wheaton got behind, Coppola pressed and tried to do too much, many times going 1 on 3 and forcing a bad shot or pass. Also, Degnan played completely out of control and was creating a lot of the "extra" friction by diliberately bumping into WPI players after the whistle and going overboard with the trash talking. I dont see this happening to MIT. Bartolotta will not be as easy to fluster as Coppola, and Wheaton has no one like Johnson. I think the 2 major keys are are Gampel's ball handling and the Johnson Vs whoever matchup. you never know what might happen, but I don't see WPI having any good answer for Johnson. From their roster & stats page (& what little I saw of them this year so far) , it would appear they are going to have 3 guys playing him. The big kid Lessard can get the better of Johnson in low post, but I dont think he can play him on the perimeter. If they go small (Stewart & Perez), I can see Johnson getting the better of it down low, and also just shooting over them from the outside. According to the roster, WPI only has one other kid on the roster who can present a good size matchup, but he doesnt play much at all. As far as handling the ball, WPI might be able to wear down the MIT ball handlers. How much does JB bring the ball up? Will MIT use him more in that role if the pressure starts creating turnovers? WPI definitely has the advantage in depth and fresh bodies. Certainly if Johnson or JB get into foul trouble, that tips the scales toward WPI in a big way. Lots of interesting "issues" for both teams in this game. My hope is that the officals let them play, but not the extent that my Wheaton friends witnessed. I want to see a good game between the best the NEWMAC has to offer this year. Yeah, its not just those 3 either, there were 2 other big men and 2 other forwards who all quit (for academic or other reasons). Also, Dan McCue, who was a top 3 scorer for the team last year is out for the season with an injury. MIT is doing pretty well regardless, though. The guys they have fit in perfectly to the style they are playing currently, although I am sure they would love to have some more players (so they could at least practice 5 v. 5 without the coaches playing). 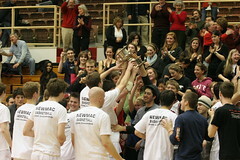 The new top 25 poll is out and there are 2 NEWMAC teams receiving votes: WPI is 29th and MIT is 34th. I believe this is the first time that MIT has ever received votes in the d3hoops.com poll. In 05-06 when they won 21 games, I dont believe they received a single vote. Congrats MIT and hopefully you can bring home a W on Wednesday! Possible hitch in the game on Wednesday - SNOW!!! Possible 6 to 12" for the Worcester area on Wednesday! Not looking too good for the NEWMAC games today. The snow is coming down wicked fast here in Cambridge. I dont see how MIT could make it to WPI (where it is supposed to snow more). You never know though. Today's WPI game is ON. Yeah, I talked to some people in the MIT athletics department after I made my previous post and they are going to try to make it up there (the roads are horrible though). MIT has games on Saturday and Monday so they would really like to get this game in on time to allow for normal rest so that they dont have 3 games in 5 days and 4 games io 7 days. MIT loses a tough one tonight at WPI, 68-55. After going up 12-2, seven minutes into the game (WPI scored its first FG at 12:48), MIT gave up an 9-0 run over the next 1.5 minutes. WPI followed up their 9-0 run with another 8-0 run after a couple traded baskets to take the lead. MIT then followed with an 8-0 run to take the lead 27-26 with 3:55 to go in the first half. WPI finished the half strong to go into the break up 37-30. Much of the second half was back and forth. The lead was usually about 5-7 points for WPI, but crept into double digits at the end of the game. MIT had a few chances down the stretch down by 7 or less, but could never convert and WPI took care of the ball to preserve the lead. Jimmy Bartolotta fought foul trouble and had his worst scoring (and shooting) effort of the season, going for 17 points, 6 rebounds and 4 assists. Billy Johnson added 20 points and 7 boards for MIT and Jamie Karraker chipped in 11. WPI was led by Jeff Robinson with 17 points, while Jerome Kirkland and Bennett Lessard each added 12 points. Lessard also had 9 boards. The difference was FG%, MIT was held to 37% and WPI shot 48%. With all that said, if you asked Coach Anderson at the beginning of the season if he would take a 5-1 start in the NEWMAC, going 4-1 on the road in that span, I am sure he would have taken it. MIT finishes their season with 5 of 6 conference games at home, while WPI plays 4 of their final 6 on the road (including at MIT). With that win, WPI moves up to become the top rated rated team in New England in today's Wilson Computer Poll, tied with Amherst at 541. Middlebury is at 540. MIT drops about 4 points to 515, currently 9th in New England. This poll does change frequently (if not daily). I had hoped to be able to give you a first-hand report, but other priorities prevented that. My next door neighbor fell and cracked her hip last evening as she was trying to clean her steps off. My wife & I spent most of the evening at the hospital with her. Anyway, I was very surprised when i got home and scanned through box score. Give the Lessard kid credit, from what I read in the recap and the box score, he stepped up big in a big game! Robinson gave WPI a huge offensive lift off the bench. Does anyone know what happened to JB that caused him to draw the "T" ? They obviously did a great job making life difficult for him. I was really expecting a much better performance from him. Does anyone know who drew the defensive assignment to guard him? Johnson seemed to be effective playing all 40 minutes and shooting well. JB was 6 for 16 and only 1 for 5 from 3pt range. Gampel did appear to struggle some with 6 turnovers, but then Lirette from WPI had 5 as well. Big difference there was Lirette had 9 assists while Gampel only had 3. This gives WPI the inside track to the #1 seed, but they do have to hold up on the road as 4 of the remaining 6 are away. I dont know why he got the technical, but I was pretty shocked to see it on the livestats. That is the first time I can remember that Jimmy B has ever gotten a technical at MIT (and I have been at MIT since he was a freshman). I may not be remembering one he had in a past year, but he is usually the most calm and collected person on the court, and this is definitely the first one on the year for him. But these are the types of things that happen on the road I guess, so MIT just needs to take care of business at home. It will be important for MIT to continue to win their league games (they have 5 of 6 at home, with the lone road game being at Babson) so that they have a shot at beating WPI at Rockwell Cage in MIT's second to last game of the season. I am not sure what the tiebreakers are, but if both teams are 11-1, splitting against eachother, it would be interesting to see who hosts. Anyone know if it would be a coin toss or something else (just out of curiousity)? A major turning point in the game was when Jimmy Bartolotta (JB) got whistled for a PF and a Tech Foul at 7:39 in the first half. Similar to the Gordon game, JB gets called for a curious foul away from the ball(?). I didn't see what happened or what could have justified a T. The Technical put him at 3 fouls and then at 3:28 he was called for his 4th in the first half. The game was tied at 27 at that point and JB went to the bench. It seemed to affect MIT psychologically for the rest of the game. WPI plays a lot of handchhecking and shirt grabbing that didn't get called as fouls, but that seemed to draw MIT into retaliation/frustration fouls. MIT played a zone for about 15 minutes of the second half, apparently to protect JB from fouling out. The game was a 7 point spread at half and basically the second half was a stalemate w/ MIT's zone and inability to get ever back into their offensive rhythm. Give Coach Chris Bartley credit, they took MIT out of their game and kept them out of it. WPI's defense was effective, holding MIT to 55 points as they average 75 ppg. Obviously, MIT needs to develop better confidence and swagger when JB or Bill Johnson is out of the game to win over the long haul. They could use some offensive diversity for the second go-around in the NEWMAC. Loose balls and loose rebounds were typically being won by WPI. MIT may never be able to match WPI's energy, so they'll need to make up for it with more careful ball handling and less risky long passes that were being turned over by WPI. WPI has a roster unlike the rest of the NEWMAC. It's deep with quick, aggressive, athletic guys who play good man defense and while not great shooters or scorers, will make their share of shots if left open. Their aggressive ball hawking eventually creates enough havoc and turnovers that some open opportunities result. No one else in the NEWMAC plays like this. Someone posted elsewhere that WPI is weak inside, but they do have 6-8 Bennett Lessard who is a space eater and can bang with anyone in the NEWMAC. Otherwise they are undersized and it would seem they could potentially be exploited in close by a 4 or 3 posting up or possibly driving to the hole on a clear out (have to draw Lessard away from the basket). Interesting that Bartley has 2 guys (seniors Kirkland and Izuchi) from O'Bryant HS and now 2 guys from Lowell HS (freshman Perez and Brown).